I'm a Beaver now, a photo by PhylB on Flickr. I've been a Beaver now for three weeks. I have the uniform and they've been letting me try archery. It's fun. 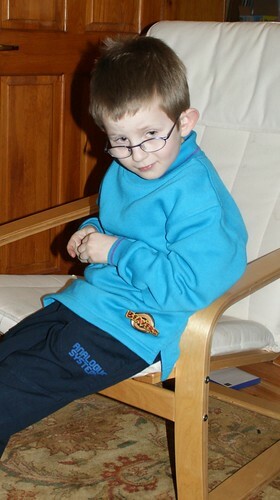 I can't wait till I make my promise, so I can get a necktie and woggle like my best friend Fraser. Cooking dinner for the first time ever. 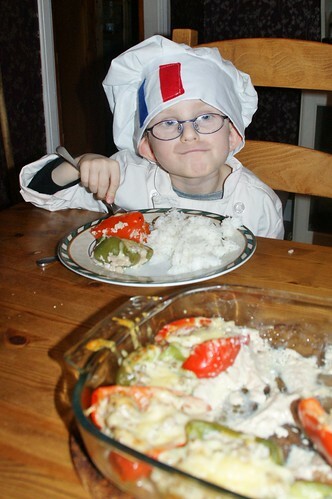 Léon cooks dinner for the first time ever., a photo by PhylB on Flickr. Yesterday Thomas decided I was old enough to be added to the chef chore rota at our house. After all I am 6 now! So I got to make dinner for the first time for the whole family. I made stuffed peppers with Swedish cheese and rice. It was nice. Mummy and Thomas loved it. The rest of us thought it'd have been a bit nicer with less pepper and more mince though! Léon's new hat, a photo by PhylB on Flickr. I've got a new fur-lined hat. I wish it would snow so I would need to wear it more.